My stupid knee... it just had to get messed up right in the middle of the running season. I've already done 2 5k's & this Saturday is a 10k - then the 10 mile-run, then the half marathon. I just want to get through the 10k. I didnt pay to enter the 10 miler, so I dont feel so bad skipping on that one ... that will give me 7 weeks until the half marathon. So I can take a week or two & lay off of it, but still have time to train in the end. Those are my plans anyways... funny... we all know how often our plans work out how we want them to - right? Oh, RJ, I hope it feels better soon. Take care of yourself, and rest it when it when it is demanding to be rested! Love your analogies! Always spot on! And praying for your knee! Maybe God just needed you to take a little time out and rest a little. Hopefully you'll get some relief soon! xoxo!! I am so sorry to hear that your knee is bothering you as badly as it is. Please take good care of yourself and get better QUICK! You know you'll be close in my prayers! Hang in there, my friend! The thing I'm working on is being thankful even during the painful times. I love how you take the little moments in your life and turn them into a lesson for life. I'll be praying for your knee! I'm so sorry about your knee and will say a prayer for your quick recovery. But I love how you turned it into a sermon and one I need to be reminded of often. I hope that knee starts feeling better real soon. Have you been to the doctor yet? 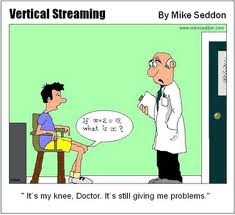 If it is in the kneecap area, you may need to get that checked out. oh i am so working on this now! thank you for this post today. praying your knee heals up soon and the pain goes away. Wow. That's a really good analogy! I don't think I would have thought of it that way either. Great post! Be careful with that knee! Great post though! As always, very inspiring!